In the late 1980's, Northland Innovation Corporation developed a DOS based program called RUOK® that used a PC and modem to make telephone reassurance calls. In 2005, Database Systems Corp. (DSC) developed CARE®, which is a modern Windows based system, to replace these older calling systems. CARE has the added features that make it far superior the original RUOK system and is being continually maintained and enhanced to improve its applicability to perform telephone reassurance calls. DSC is a recognized leading provider of automated phone systems and software and has been in business since 1978. DSC technology includes computer telephony software solutions and automated phone systems. 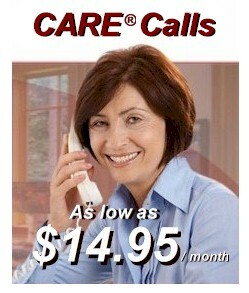 DSC has developed and markets a telephone reassurance program called CARE. This modern program checks on the well-being of seniors and home alone residents. Note: Northland has subsequently attempted to convert this program using an outsourced contractor to a Windows operating system. However this product has been installed with very limited success. (See client profile below). For a comparison with our CARE system, please visit our RUOK® vs CARE web page. Contact DSC to learn more about our CARE phone systems and telephone reassurance services. "The North Charleston Police Department's mission is to provide professional public safety services while working in partnership with the citizens of North Charleston to identify, prevent and solve the problems of crime, social disorder and neighborhood decay, thereby improving the quality of life in our community. " The North Charleston Police Department was an original RUOK® client. However, because of numerous problems and the failure of the original RUOK® program, the North Charleston PD removed this program and selected the CARE (Call Reassurance) phone system from Database Systems Corp. to provide its senior citizens with a phone reassurance service. Because many groups are looking to upgrade or replace this older technology, DSC has prepared a comparitive chart that demonstrates the difference between these systems. The following chart lists the different features and capabilities of the CARE program from Database Systems Corp. and Northland Innovation's "Are You OK? "® product. Visit the DSC RUOK® vs CARE web page so see the many advantages of CARE over RUOK®. Besides offering CARE phone systems, DSC provides individual CARE service including an easy and secure sign-up procedure (For a quick overview, please visit the registration information web page). 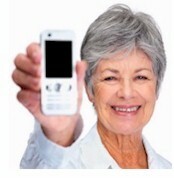 Senior's Profile - Specify the senior citizen's profile (dates and times to make calls). Name Contacts - Identify who we need to contact if we can't reach the senior. Plus our service is performed automatically. 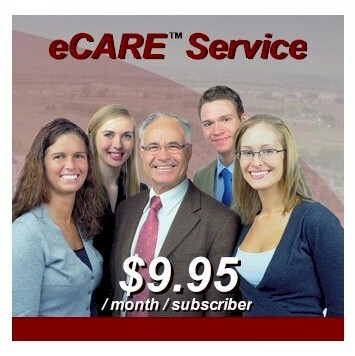 Click on the Create eCARE™ Account link below. Contact DSC to learn more about our CARE senior calling program that replaces traditional RUOK systems. Note: * "Are You OK? "® and RUOK® are registered names belonging to Bruce Johnson of Northland Innovation Corporation. The term "Telephone Reassurance" is commonly used on many community websites that offer both automated and volunteer based telephone reassurance programs.